If you need somewhere in People Inc. to record parking tickets, speeding offences, and collisions that involve employees and/or company vehicles, you can easily add in a brand new screen with all of the fields you need e.g. the date, location, and penalty incurred. The information you collect can then be analysed regularly using reports. In order to illustrate this we have created template screen which does just this, and only takes 15 minutes to install. Easy to establish which employee are involved in an incident and assign and track fines that may be incurred.<. Possible to generate e-mail or letter-based correspondence relating to the incident using standard functionality available in the People Inc.
Where follow up actions are appropriate, reminders can be added to the action list to ensure these take place. In extreme cases (perhaps where multiple incidents are recorded), it may be necessary to add details of associated disciplinary proceedings. 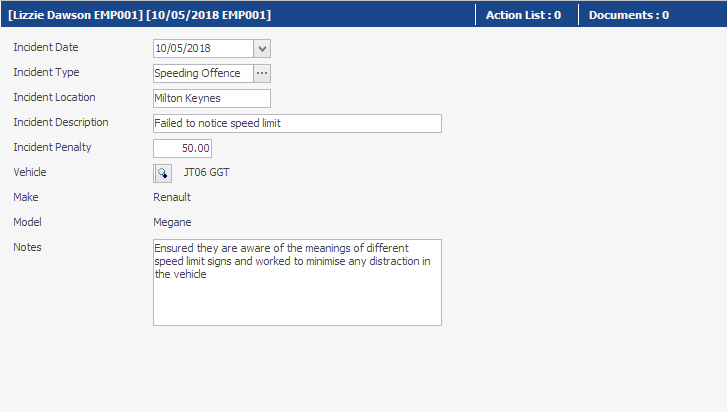 Information recorded via the Driving Incidents screen can be analysed (using reports) to identify those that would benefit from further training and to calculate the cost of motoring fines. If you would like to find out more, please contact out helpdesk (01908 265111 or support@pasoftware.co.uk) if you have any questions or would like to implement this screen.